Happy Halloween from all of us at College Gym News! Before you head out trick or treating (or to enjoy some adult treats) take a stroll through the college gymnastics graveyard. We’ve lost so many teams over the years; raise a glass or piece of candy corn in memory. Note that a good number of these women’s programs were terminated before 1982 therefore were never part of the NCAA and may have been what we would now consider a club-level program. This is far from a comprehensive list. We’re working to build a complete database of all men’s and women’s programs that have been disbanded. If you have any information about the teams below, or know of a program that we are missing, please email managing editor Emily M or let us know in the comments! We’ve chosen select programs to eulogize, and the full list of teams follows. Women: 1976-2011. Fullerton made 13 nationals appearances all-time, seven of which were under the NCAA. 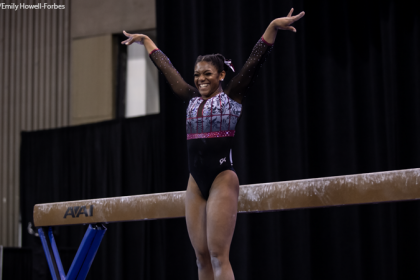 It finished as high as fourth in 2003 and won the AIAW title in 1979. Notable gymnasts include Tami Elliot, a 10-time All American, and Barbie Myslak-Roetert, the 1979 AIAW vault and bars champion and a nine-time All American. Men: Disbanded in 1992. Fullerton competed as both a Division I and a Division II team. Under Division I, the team finished eighth at NCAA nationals in 1976, 1977 and 1978. It took the Division II title in 1970, 1971 and 1974. Notable gymnasts include Leonard Caling, 1971 Division II pommel horse champion, Mike Kelly, 1972 Division II parallel bars champion, and Sam Shaw, who took the vault title in both 1974 (Division II) and 1976 (Division I). 1899-1948? Former Big Ten athletic powerhouse Chicago* won the 1917 national title and took the NCAA Division I title in 1938. Courtney Shanken was the 1941 national all around and rope climb champion. Erwin Beyer was a four-time national champion (1936-1938) and would go on to coach the 1948 women’s Olympic team. Earl Shanken won three consecutive vault titles (1940. 1941, 1942). Active in the late 1960s to 1979, Clarion won the AIAW title in 1976, 1977 and 1978 and was undefeated under coach Ernistine Weaver, who led the team to a 58-0 record over 10 seasons and coached the championship teams. Weaver would go on to coach at the University of Florida. Connie Jo Israel was the 1976 AIAW all around champion and the Honda Award recipient for gymnastics in the same year. 1899-?. Columbia University was part of pre-NCAA gymnastics competition, winning the national title in 1900. Many schools that supported gymnastics in this era dropped teams during World War II. Women: Active in the 1930s to ‘70s. Suzette Gosling Owens was an individual qualifier to the AIAW championship in 1977, and Beth Fraley McMahon was a beam All American in 1978 and AIAW all around qualifier in 1979. Men: Active in the 1930s to ‘80s. East Stroudsburg won the Division II title in 1983 and 1984 and finished second in 1982. Coach Bruno Klaus (founder of the International Gymnastics Camp and former Southern Illinois gymnast) was named Division II Coach of the Year in 1983, 1984, 1985 and 1988. Franklin Winstead won the 1982 floor title, Alan Emerick took the high bar championship in 1983, Jeff Clements won floor in 1984 and Joao Luiz Ribeiro took the all around, parallel bars and high bar titles in 1984. 1899-?. Haverford is another pre-NCAA era men’s team. It finished second in the 1917 national championship. Active in the 1970s and ‘80s. Jacksonville State won the NCAA Division II title in 1984 and 1985. Under coach Robert Dillard (who would finish his career at Auburn), the team had a 201-67 record and posted nine winning seasons from 1975 to 1985. Dillard won the Kellogg’s National Coach of the Year award in 1977. Gymnast Jennifer McFarland was a Honda Award Nominee in both 1984 and 1985. Susan Puckett (1980, 1981) and Marilyn Hanssler (1982, 1983, 1984) were both multiple All-American honorees. 1968-1984. LSU finished second at the 1975 and 1976 NCAA national championships and made 10 championship appearances. When the program was shuttered in 1984, the Tigers had a 189-78 record. Coach Armando Vega was named the NCAA National Coach of the Year in 1977 and 1978. The program produced 22 All Americans. 1930s?-2001. Michigan State tied for the national title in 1958 under coach George Szypula, who led the team to 252 victories over 41 seasons. Carlton Rintz was the 1954 pommel horse champion and took the parallel bars, high bar and pommel horse titles in 1955. Dave Thor was named the 1968 Nissan Award winner and went on to make the 1968 men’s Olympic team; he was the Big Ten all around champion in 1966, 1967 and 1968. The MSU men were ranked No. 3 when the school cut the program in 2001. Active in the 1950s to 1970s. Northwestern State took the Division II title in 1970. Under coach Jeff Hennessy, the team won three straight conference titles (1957-1959, Mid-South Intercollegiate). Richard Lloyd won both the National Association of Intercollegiate Athletics and NCAA Division II national all around titles in 1967. Coach Armando Vega was named the NCAA coach of the year in 1970; he would go on to coach at LSU. 1974-1986. Oklahoma State finished ninth at the 1982 Division I national championships. Kevin Mabrey (1981), Usa Hartman (1982) and Liz Parry (1984) were the school’s All Americans. Women: 1959-1987. Unfortunately Oregon has not inducted any female gymnasts into its hall of fame and little external information exists. We do have a list of former athletes, however. Men: 1960-1981. Oregon made five nationals appearances, finishing as high as third in 1980. Scott McEldowney was the 1978 rings champion, and James Yuhashi took the 1981 floor title. Women: 1976?-1984? Southern California finished as high as fifth in the AIAW national championship in 1976, 1977 and 1978. Men: 1958?-1981. On the men’s side, USC won the national title in 1962 under coach Jack Beckner. Makoto Sakamoto was the 1967 all around and parallel bar champion and won the all around, parallel bar and high bar titles in 1968. Active in the 1960s and ‘70s. Southern Connecticut State won the Division II national title in 1973, 1975 and 1976. The Owls boast 27 Division II individual titles, led by John Crosby (1971, all around, floor, parallel bars; 1972, all around, floor, vault, parallel bars; 1973, all around, floor, vault, parallel bars, high bar); and Peter Kormann (1975, all around, floor; 1976, all around, floor, vault, high bar, rings). Other title winners include Jim Amerine, Jay Whelan, Jim Yearwood and Dave Mesagno. SCSU continues to field a women’s team. Women: 1962-1986. Southern Illinois won the AIAW title in 1970, 1974 and 1975 and was undefeated in the 1966 to 1969 seasons. 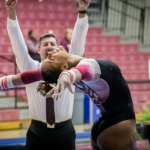 SIU boasted a number of individual title winners: Gail Daily Bakker (1969, vault and beam); Irene Haworth Lacy (1966, all around); Donna Schaenzer Kramer (late-1960s, three-time all around champion); Terry Spencer (1973, floor) and Judy Wills Cline, who was undefeated in her trampoline and tumbling career, which fell under gymnastics in the 1960s. Men: 1929-1989. The Southern Illinois men won the national title four times, in 1964, 1966, 1967 and 1972, and boasted a 68-meet winning streak from 1961 to 1968. The Salukis had a long list of individual champions on the men’s side as well—Hubie Dunn (1943, swept all six individual event titles); Bruno Klaus (1960 and 1961, high bar; 1962, vault); Rusty Mitchell (1964, floor; 1962 and 1964, tumbling); Gary Morava (1972, vault); Fred Orlofsky (1961, rings); Charles Ropiequet (1971, rings); Frank Schmitz (1965, floor and tumbling; 1966, floor and vault). 1969-1980. Southwest Missouri State made four AIAW nationals appearances under coach Charles Johnson (1976-1979), including finishing second in 1976. Olympian Kolleen Casey won the 1978 vault title and took the all around title in 1979. Casey also won the Broderick Award for gymnastics in 1979. Cheryl Diamond Murray was the bars AIAW champion in 1976 and 1977. 1948-1997. 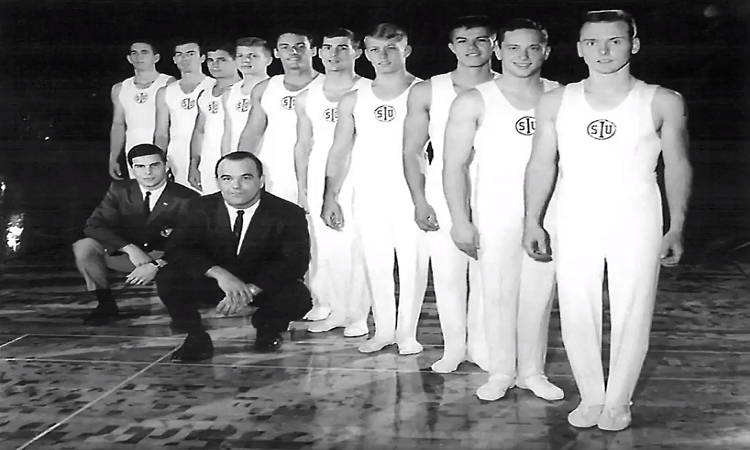 Syracuse finished third in the NCAA national championships in 1953 and 1963. The school holds six individual championship titles: Gene Rabbitt (1950, pommel horse); Leo Minotti (1950, 1951, rope climb); James Sebbo (1953, tumbling); Sydney Ogelsby (1964, vault); Jason Hebert (1992, vault). 1930s?-1994. The Bruins won the men’s national title in 1984 and 1987, both under coach Art Shurlock. 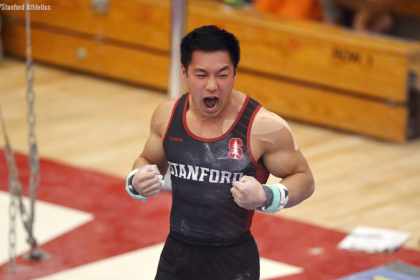 Men’s gymnastics upheld the UCLA Olympian tradition, with team members including Tony Pineda, Mitch Gaylord, Tim Daggett, Peter Vidmar and Chris Waller. The men won countless individual titles. Active in the 1970s and 80s. Oshkosh took the men’s Division II title in 1980, 1981 and 1982, as well as two WIAC conference titles (1973 and 1974). The team also won eight NAIA titles between 1973 and 1983. UW-Oshkosh maintains a women’s team. 1899-? and circa 1930s-1980. Yale is another pre-NCAA era team shrouded in mystery. The Bulldogs won the national title in 1901 and 1902. The team seems to have faded out sometime early in the 20th century until being revived as an NCAA varsity sport by Olympian and coach Don Tonry sometime around 1930. Under Tonry, the team won three Ivy titles. The women’s team, coached by Don’s wife Barbara, still hosts the Don Tonry Invitational every year in his honor. If you want to support the continued growth of the sport—and the protection of teams in danger of being terminated—consider making a donation to the Collegiate Gymnastics Growth Initiative. *The University of Chicago was a founding member of the Big Ten and remains an academic member of the conference while currently competing under the University Athletic Association. It is the home of first Heisman winner, Jay Berwanger, and was coached by the legendary Amos Alonzo Stagg, who led the football team to two national championships in 1905 and 1913. The team also initiated the Monsters of the Midway nickname now used by the Chicago Bears. Herman Stegeman (yes, that Stegeman) was a member of the 1913 championship team. The more you know. Emily M is an alumna and likes to dispel the myth that nerd schools don’t do sports. Go Maroons! Chicago maintains a co-ed non-competitive club gymnastics team. Great article!!!! Grwat info that we need to keep in front of us! Thank you! Jacksonville State University is in Jacksonville, Alabama. Robert Dillard was their head coach until he moved to Auburn and Tom Cockley was the last head coach for the Men’s Program. I was there in 77-80 under head coaches Harold O’Bryant and Steve Bonham after him. There was also David Lipscomb College near Nashville. They had a men’s program for sure…Not sure about a women’s program. I assistant coached at Memphis State during the 82-83 season so they had a men’s and a women’s program there. Indiana State had a NCAA Championship, 50+ All Americans, and NCAA Champions Dave Seal(twice)), Ed Slezak, Rick Danley, Kurt Thomas, and Bob Mahoney. Roger Counsil’s influence on the young men in his 15 years as coach cannot be diminished by the terrible decision to end the program. Eastern Kentucky University had a men’s team also. Both were dropped the same day. I believe Frank Schmidt from Southern Illinios won the 1965 trampoline event and not tumbling. Trenton State College, now the College of N.J. Both Men and Women’s teams!!! Thank you for writing this article!! Radford University also had a successful men’s program in addition to the women’s program. A major wave of dropped programs came when the NCAA forced out the AIAW. I have been working the last four years to add gymnastics to the Southwest Missouri area and have learned a lot. I am willing to help so call me at 314-225-1500. Kansas State also had a men’s team.